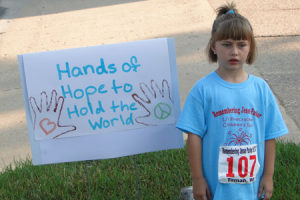 Tomah Area School- Dreams of Compassion - Remembering Jesse Parker, Inc. The Remembering Jesse Parker public charity is fortunate to partner with the Tomah Area School District and their Rachel’s Challenge project to encourage compassionate activities that engage our local youth. News Channel 8 WKBT, reporter Mike Thompson recently highlighted many of these efforts in his spotlight on compassion report. We are proud of the tremendous efforts of our wonderfully engaged educators, children and community leaders who have taken this compassion effort and changed lives. Tomah is a beautiful community. Deep thanks to the tremendous donors and supporters who make funding these activities possible. At the beginning of this school year, the foundation gave $10,000 to the Tomah School District. “And the vision was simply that whatever kids thought was a compassionate activity, whatever they wanted to engage in, we agreed and we wanted to support them in any way we could,” Jen Parker said. “I was like, this is a perfect opportunity to get this started,” said Tomah Art Teacher Melissa Mulvaney. Lemonweir 3rd grader Anna Rose created her HeART club piece to hang on the wall at the Chasing Daylight animal shelter. “I thought it would be kind to do that because they’re saving animals from the different homes they had and if the owner was mean, the shelter would be nice and kind to them,” said Rose. 4th grader Aisha Hughart’s artwork will hang on the wall at the Tomah VA Medical Center. The Tomah Middle School has created student guides, including a party for kids who often do not get to go to parties. “It brought me great joy because some kids were so happy, they were almost crying and it was just really great to see how happy they were,” said Tomah 8th grader Chadd Williamson.”We’re trying to make a bigger difference and impact on kids to be nicer and show more compassion,” said Williamson. “I’ve seen like people helping people on the playground, like actually playing with one another,” said Rose. Our deep thanks to Mike Thompson and the News 8 team for sharing these efforts with their viewers.